At Sentieo, we are always striving to give fundamental managers the tools to make better decisions faster. Table Explorer (TableX), the next iteration of our suite of table analysis tools, was developed with this vision in mind. Model-building is an essential part of the investment process of fundamental managers. Models afford them the ability to develop a deep and differentiated understanding of the machinery of a business, via the interplay between revenues, expenses, and capital accounts. Models also allow for a parameterized flex of assumptions for establishing a differentiated view on a company’s earnings prospects and — by extension — the value of the business overall. While modeling is critical to the process, the investment world is increasingly driven by algorithm-enabled trading and the large data science departments of multi-billion-dollar hedge funds. Therefore, managers are obligated to pay close attention to the areas where modeling and data visualization can happen faster, and more accurately. At Sentieo, we believe in an augmented investing approach that uses machine learning and data science to add value to a human-driven investing process. We’ve rebuilt our table suite from the ground up using a machine learning driven approach validated by trained financial analysts. 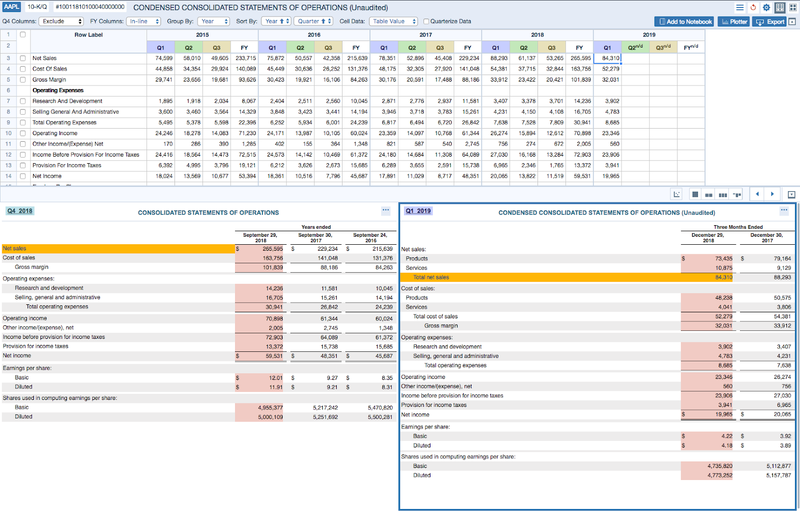 The new TableX enables Excel-style visualization directly from company filings in a dual-pane window, showing both the Excel data and the source document side by side, enabling an immediate audit of every number. We’ve added the ability to quickly plot discrete line items in the same window, enabling simple thesis exploration either as a complement or antecedent to further model work. We’ve also added inline calculations to impute fourth-quarter numbers from 10K data, common size analysis, and YoY or QoQ percentage changes. And we show a table of contents of all tables in a document to speed up navigation through company filings. Then, we integrated TableX with our Plotter app, to further facilitate regression analysis of fundamental metrics like revenue with other metrics like exogenous macroeconomic data or website traffic. We also integrated TableX with our Notebook app to facilitate thesis sharing among a team or when reporting to a portfolio manager. These workflow tools help money managers develop ideas faster and stay more organized with their ideas. Lastly, we facilitate export to Excel so that the audited financial data can be used as a backing database for your own models. We include links back to the document in the export, and in future releases, we will enable “one-click” refreshing of base data sheets in models. The end goal of Table Explorer is to give fundamental money managers the tools to observe-orient-decide-act faster, in order to win in a high velocity investing landscape. Get a free trial of Sentieo here, or tell us what you think of the new TableX! Get a free trial of Sentieo here, or tell us what you think of the new TableX!